Purdue University has played a leading role in providing the engineers who designed, built, tested, and flew the many aircraft and spacecraft that so changed human progress during the 20th century. It is estimated that Purdue has awarded 6% of all BS degrees in aerospace engineering, and 7% of all PhDs in the United States during the past 65 years. The University’s alumni have led significant advances in research and devel­opment of aerospace technology, have headed major aerospace corporations and government agencies, and have established an amazing record for exploration of space. More than one third of all US manned space flights have had at least one crew member who was a Purdue engineering grad­uate (including the first and last men to step foot on the moon). The School of Aeronautics & Astronautics was founded as a separate school within the College of Engineering at Purdue University in 1945. The first edition of this book was published in 1995, at the time of the School’s 50th anniversary. This corrected and expanded second edition brings the School’s illustrious history up-to-date, and looks to Purdue’s future in the sky and in space. Professor Alten F. (Skip) Grandt, Jr., is the Raisbeck Engineering Distinguished Professor of Engineering and Technology Integration at Purdue School of Aeronautics and Astronautics. He began his career as a materials research engineer at the Air Force Materials Laboratory at Wright-Patterson Air Force Base, where he worked for eight years. Dr. Grandt joined the faculty of the Purdue University School of Aeronautics and Astronautics in 1979 and was head of the school from 1985 to 1992. Professor W. A. Gustafson was named to the faculty of the School of Aeronautical and Astronautical Engineering at Purdue University in 1960 and was associate department head from 1980 until retiring in 1998. He also served as acting head during the 1984–85 academic year and the spring 1993 semester. He has been a mentor to hundreds of undergraduates, many now leaders in aerospace disciplines. 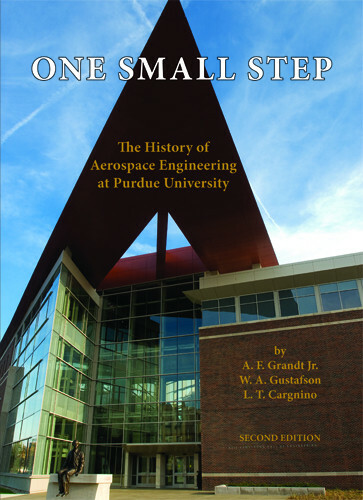 Professor L. T. Cargnino joined the Purdue School of Aeronautics and Astronautics in 1945, and taught until his retirement in 1984. Professor Cargnino was the main undergraduate counselor during his tenure, and advised many BS degree recipients during this time. His students have gone on to play leading roles in corporations and academic settings.